I did my best to cut back on caffeine while pregnant; but it was tough. Some of you non-coffee drinkers may be raising your eyebrows right now...but seriously! The hardest thing for me was cutting back on coffee. I still had the odd cup, but through that experience I tried many different drink options to see what helped to replace or reduce the need for my beloved "double-double". Here are my favourites. Best of all, these are all low caffeine or caffeine free! 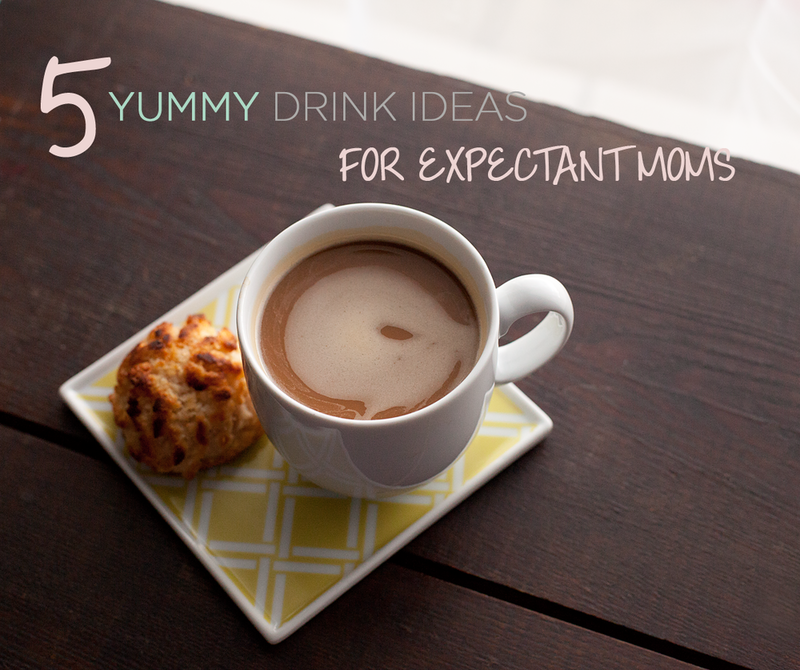 You can enjoy these guilt free (even if you're not expecting)! #1 - Ice water with crushed Lemon & Mint. This one is great if you're pregnant during the summer heat. Very refreshing -- and mint is said to help with nausea. I washed my lemons first, squeezed a slice or two into a glass or water bottle. Toss the lemon slice & peel into your glass, too. Add in 3 or 4 slightly crushed mint leaves. Add ice & filtered water. Bring a straw so you can sip away while you work. #2 - Iced raspberry herbal tea. This was one of my favourites. Brew your favourite herbal tea (mine is red raspberry). Boil your water, and brew a large batch of tea - about 4 or 5 cups at a time in a big teapot (or bowl) for about 2 hours. When the flavor is sufficiently infused, pour the brewed tea into a glass pitcher and chill in the fridge. Add in some raw honey and fresh raspberries for some mild sweetness. You can get really creative with the flavours, by combining different teas, adding in different spices, fresh fruits or berries. #3 - Pumpkin Spice Latte from Gracious Pantry. way less chemicals than other decaffeinated coffee). I buy fresh beans from Beantown Coffee on Reeve Street in Woodstock. They stock Fire Roasted Coffee Co. beans, and it's divine! The recipe itself is from an amazing clean eating blog called "Gracious Pantry". Check her out! Just substitute caffeine free beans for caffeinated ones. Find the recipe, here. #4 - Chai Tea Latte (rooibos or herbal tea variety). I use Celestial Seasonings "Bengal Spice" tea (you can get it at Bulk Barn in Woodstock). You can do this one of two ways. The best way is to warm up a cup or so of milk in a saucepan on your stovetop. (You can cheat and use the microwave, too). I add one teabag into the hot milk, and let it brew for about 3 to 5 minutes. From there you remove the teabag, add a sweetener of choice (maple syrup is my personal favourite) and pour into your favourite mug. Heaven! The quick way is to just brew the tea and add LOTS ofmilk and sugar. In a hurry this beats the caffeine craving quite quickly. #5 - Orange cream smoothie from She Knows. Get the recipe, here. You need a drink blender for this delicious treat. I skip the sugar and substitute coconut milk to make it oooh so creamy. The orange juice adds a light citrus flavor! The touch of vanilla makes it almost like drinking a creamsickle. Such a yummy morning drink and it only takes 5 minutes to whip one up, making it the perfect on-the-go refreshment! I hope these yummy drink ideas keep your tastebuds happy!